Kartell and Modcloth have a search bar at the top right of the home page. All three have large images displaying their content on their home page. Mod Cloth and Warby Parker have their menu displayed horizontally close to the top of the page. All three have their “cart” or “shopping bag” displayed at the top right hand corner of the home page in either words or icons. Warby Parker and Mod Cloth are completely focused on purchasing items online. There are very little mentions or visual cues to find other types of information, however that information is still available. All three have noticeable icons to sign up for their email lists. Warby Parker has their logo at the top Center of their home page. 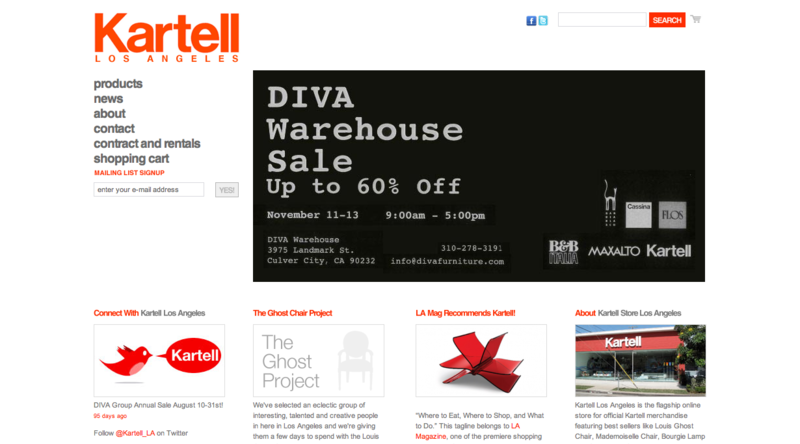 Kartell has social media icons at the very top of their homepage. Modcloth has social media icons towards the bottom of the page, but not at the very bottom. Warby Parker has social media icons at the very bottom of the webpage. Modcloth has the most sub categories for their products because of the amount of different types of products they sell. Modcloth: The visual design is very focused on their most popular product; Dresses. Every option clicked gives an example using a picture of their dresses. The organization of the products is very meticulous and separates everything very clearly. This seems important to the user because of the variety of options the shopper has to sift through. Warby Parker: The visual design is very clear and adamant about what they are selling. Their glasses are not convoluted with other products because there are focused on selling only their glasses. The organization of the their merchandise is very clear and the visual cues point directly to either prescription glasses or sunglasses using pictures. Kartell: The visual design assumes that the customer already knows the aesthetics of the brand and what the store sells. Kartell also features their most popular product; the ghost chair. Kartell seems to expect its customers to purchase their products more in a store than online. This is because their products section displays their products more like a virtual catalogue than a shopping function. Marcy is a 25 year old, single, working professional, living in Seattle. She works as a professional hair stylist and surprisingly makes a comfortable amount of money due to her new thriving business in Belltown. Not only does she have eclectic taste when it comes to clothing, accessories, or apartment decorations, but she has quite a few good friends who share her interests. Marcy and her friends are interested in eccentric, colorful, vintage, and unique things they like to use to dress themselves and contribute to Marcy’s new salon. Marcy has no kids or pets and is fortunate enough to have quite a large budget for gift giving. Marcy is a Seattle native and lives and breathes the local culture. This Christmas, Marcy and her eclectic friends decide to participate in a secret santa, gift giving situation. Marcy and her friends decide to only give one gift to whichever friend they pull out of the hat. This let’s each person get one large gift totaling no more than $200. Marcy pulls the name of Hannah one of her best friends. Hannah is the same age as Marcy, 25, and has similar tastes. She loves vintage clothing, chic eyewear, and modern furniture that she will put in her new apartment in Belltown. Marcy decides to purchase Hannah’s gift online so that she can give her something she wouldn’t be able to buy herself in the city of Seattle. Marcy decides to look at three websites; Modcloth, Warby Parker, and Kartell. >At this point, Marcy can separate the dresses by their type, or scroll through the dresses by popularity or price. >She decides to find the most popular dress. > Now Marcy has filtered as much as she can, and will sort through her options visually by scrolling down. > Marcy searches within her price range for a purse that matches the shoes and dress. She does this by scrolling through the pictures of the options the website gives her. > she finds the right purse, clicks add to bag. > She must create a Modcloth account. > Then proceeds through the standard of shipping and payment. >Knowing that Hannah only likes Brown sunglasses (or tortoise shell) she has to figure out which frames come in that color scheme. >Underneath each picture of the 9 frames available they have two bubbles each designated to the two color options of the frames. > Marcy has to click each bubble underneath the frames that are not already in her desired color scheme to see if they are available in the color that she prefers. The option to switch colors is not intuitive and proves only effective because of the limited options Warby Parker offers. If there were more than 9 options of frames, this would prove difficult to sort by color. After finding her desired color scheme, Marcy chooses a frame she thinks Hannah will like. Marcy has the option of 6 different views of the frames. Marcy needs to decide on another pair of sunglasses, after picking the previous frames, she was not taken directly to the shopping cart, and was easily led back to more options. after picking the second pair of desired frames, she clicks the “check out” option in the pop up window showing her the frames she has chosen. She decides to check out as a guest instead of registering as a member to avoid signing up for an email list. She continues the standard shipping and payment options. >Marcy has no idea which type of furniture to look for specifically she is only looking within a price range and is confident that Hannah will like any of the products. >Unfortunately there is no price sorting option. Marcy will have to pick a specific type of furniture and then sort through them for the price from there. >After looking at every lamp’s price, she finds 4 that are in her price range. > she picks the one she thinks will look best in Hannah’s apartment and clicks on the product pictures. > she then selects the color she likes best by selecting the color in the option drop down menu. >She inserts her zip code for Seattle to adjust the shipping costs. >No secure connection options for credit card information. > continue on to payment information and shipping information. Do’s: Do organize everything meticulously so that it is easy to find a large variety of items. Don’ts: Vintage page, doesn’t give an option to sort through items that have already been sold. Do’s: give great options to view the glasses and find out if they will look good on you. Very clear that they sell only glasses and their shows you their mission instantly. Don’ts: Don’t make options to switch coloring on glasses non intuitive and very tiny. The persona summary is original and the scenario is realistic. However, to best compare websites, the purchase should be the the same at each site. So it’s not that we are looking at “ecommerce” as an overarching genre but the sub-genres of “glasses” or “clothes” or “home furnishing”. Also, it helps the reader to write a narrative that reflects the experience rather than a line-by-line high-level set of notes. Also, remember that all links should be “hot”.